The whole thing! See it all! In glorious stream-o-vision! The entire ceremony is pretty good, thanks to the skilled toastmastery of Paul Cornell. 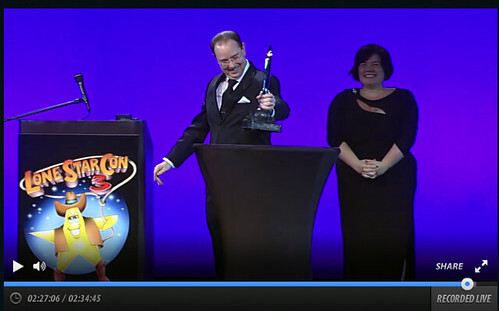 Or, if you are only interested in the parts in which I feature, the Seiun Awards are given out at 00:25:16 (and I do my acceptance speech at 00:27:15), and the Hugo Award for Best Novel bit starts at 02:24:25 (and I — spoiler! — get my name called at 02:26:20). I gotta tell you, watching the Best Novel section made me twitchy all over again. I mean, I know how it turned out, so it wasn’t like the suspense was killing me. But just watching it dropped me right back into the moment. Lots of adrenaline and sitting very very still. Yeah, it’s nerve-wracking. But in this case, totally worth it. Today’s subtweet: Dude, if you can’t even get your basic facts about me correct, what makes you think I would care what you think of me.